Fernandes Tremor electric bass with single coil pickup at the neck and humbucker at the bridge. Controls consists of separate volume controls for each pickup and one tone control. 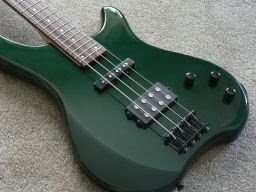 The bass has a great setup to play easily and it sounds very good. The bass is in perfect shape with no dings or scratches, the neck is a very smooth satin finish that plays perfect. The tuners are good quality and hold excellent tune. It is also quite a light weight so it’s fun to play. (from oregon you know) But Looks Like A Well made Middle Of The Road Bass Guitar.